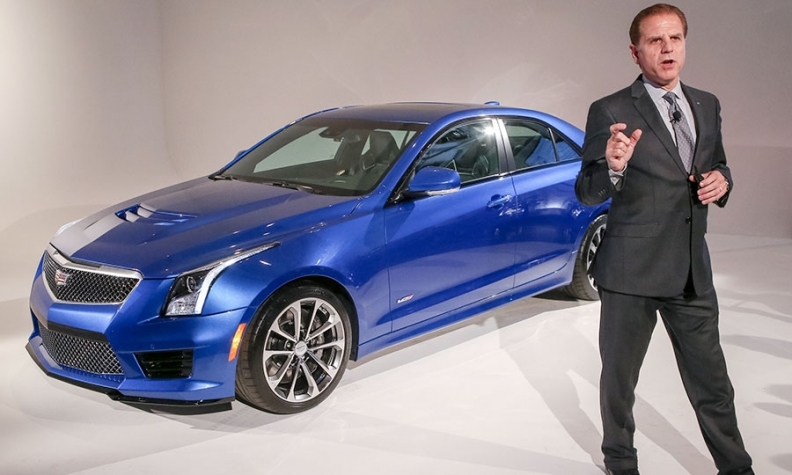 Cadillac Executive Chief Engineer Dave Leone with the 2016 Cadillac ATS-V sedan. Cadillac officials are taking a conservative view of the sales potential of the brand’s latest model, the ATS-V high-performance sport sedan. The ATS-V is engineered to take on BMW’s M3/M4 and performance machines from Audi, Mercedes and Lexus. As with earlier newcomers to the segment, the ATS-V faces a tough job breaking through. But early reviews indicate that Cadillac did a thorough engineering job and has given the car the power, handling and equipment necessary to compete with the best in the segment. Dave Leone, 57, Cadillac’s chief engineer, spoke with reporter Richard Truett in Austin, Texas, about the car and other matters. Q. Why re-engineer the ATS-V to compete with top European sport sedans when few buyers look to Cadillac for that level of performance? A. Anyone can put a high-power motor in a car and get it to go fast in a straight line. But to get it to go around a track -- to be able to get the maximum amount of lateral acceleration, so that they all work together seamlessly -- is where the real skill is. And that’s what defines the best performance. Cadillac is all-around excellence. And the excellence comes from the integration -- tying the high-speed power and the transmission, chassis, steering controls and traction control -- tying it all together. And that’s really where the difference comes out. How does Cadillac -- or General Motors -- maximize its investment in this technology? Does it filter down to other vehicles? We think we have one of the most sophisticated integration teams in the business. We have some high-performance folks that work on the V series, some Corvette and Camaro high-performance vehicles, and we use some of that same skill on our Opel OPC [Opel Performance Center] and programs and our racing program. We actually transfer people into the racing program and then back into production development. The way we capitalize on it is by sharing expertise and sharing technology and hardware. For example, our electronic limited-slip rear differential is used on the Corvette, on the Corvette Z06, on the CTS-V and on the CTS Vsport. The magnetic ride control was first used on a Cadillac and is also employed now on the Corvette and Camaro ZL1 and is standard on Cadillac. So, using that technology across our premium brands is the way we capitalize and monetize it. There has been talk of Cadillac having its own exclusive powertrains. We want to be able to differentiate Cadillac’s powertrains in three areas. One is at the power level. Two is at the refinement level, and the refinement can be in the way it sounds. And the third is in meaningful technology, whether it is a different valve technology that can drive efficiency or response time. We want those three differentiators the way we separate Cadillac’s powertrains. There will be some powertrains that remain unique to Cadillac, such as the 3.0-liter turbo we announced for the CT6. And we also have some more in the works -- with a couple of added cylinders -- that will remain unique to Cadillac. Until around the mid-1960s, Cadillac’s powertrains were built to more exacting standards than engines from other GM divisions. Is Cadillac getting back to that? There’s work under way to restore some of that separate and special standing. We are working to isolate the team that works on Cadillac to be a unique team within General Motors so that we can house some of the expertise that is necessary to create the highest level of execution. Is there frustration that consumers have not responded to Cadillac’s efforts? You always wish you were selling more. But we are trying to raise and elevate the brand. And that is not a quick step. It’s a journey. We are taking the brand from a Tier 2 to a Tier 1 luxury brand. And to be able to do that you have to have the hardware and execution to compete with the Tier 1s. When you do that it raises your cost. And when you have to raise your price the perceptions are real. They may not be true, but they are real. And you have to raise your perception of what your brand is. And that only comes with successive outstanding executions year after year. And so although the volume might not be as high as we’d like it to be, our transaction prices are up significantly. As the price goes up, the volume goes down. It will take time before our image is in line with what our actual execution is. And with that will come higher volume as the brand’s value goes up in the minds of consumers. How can GM’s marketing help Cadillac sell more cars? We’re working on a new image campaign [Dare Greatly] that you saw introduced at the New York auto show. We’re also working on a good deal of experiential marketing events. The cars have to be experienced. We need to get more people in seats. If we get people in seats and give them a chance to drive one, they’ll experience and appreciate exactly what they can do.